There are two main themes in this year’s provincial election. The need to get rid of a government that has become inept and corrupt and supporting a policies agenda that will build the province, grow the economy and create jobs and prosperity for everyone to share in. Regardless of which party wins the election, or even better, if there is a minority government, I have the experience, ability and willingness to advance the issues that are most important to the people, governments and businesses of North Island. As the former press secretary to Premier Dave Barrett, and later as a business journalist covering the B.C. 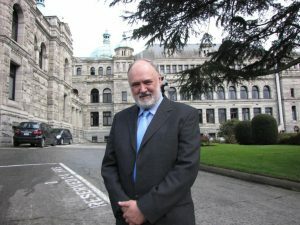 Legislature from its Press Gallery from 1986 to 2002, as well as the last 15 years as an active resident of Campbell River, I have learned intimately how the systems of government work. I have gained deep understanding of B.C.’s economy and society, how it works and what people want, need and deserve to get. My family’s roots in Campbell River go back to 1939 and I spent many summers here ever since I was born in 1949, so I am well prepared now to go to work on YOUR behalf. Because of my love for the Province, I have developed an extensive platform of truly innovative policy ideas to help it become a shining example to the rest of the world. All of these are posted on my website on my Platform page as well as on my party’s website www.bcfirst.ca, the latter of which includes links for contacts and donations. If you have questions about specific issues I would be pleased to answer them either by email at john@johntwigg.com or by phone 778-348-0747. You can also leave comments on this website and questions will be answered. To make the North Island and B.C. better than ever, vote for me now, regardless of how you’ve voted in the past. Thank you. I am on YOUR side. I put the public interest first in all things. As some may know, I had been volunteering for a different party until shortly before the election when I learned I would be unable to espouse my full platform if I ran for them. I decided to consider other options. While I liked the policies of the Vancouver Island Party, I felt the B.C. First Party offered the most freedom to espouse my novel ideas, plus they agreed to make me their leader instantly. The B.C. First Party was founded in the 1980’s by Roger Rocan, who became a very close, personal friend of mine in the 1990’s until his death about 10 years ago. After this, the party was led for a time by former Premier Bill Vander Zalm. He was followed by businessman Chris Delaney and finally, Vancouverite Sal Vetro. All of these people were instrumental in defeating Gordon Campbell’s hated HST in a referendum – a campaign I also helped with, along with others, notably Bill Tieleman. The general thrust of B.C. First is to put the public interest first in all things and that is a stance everyone can support.